Download "Web. 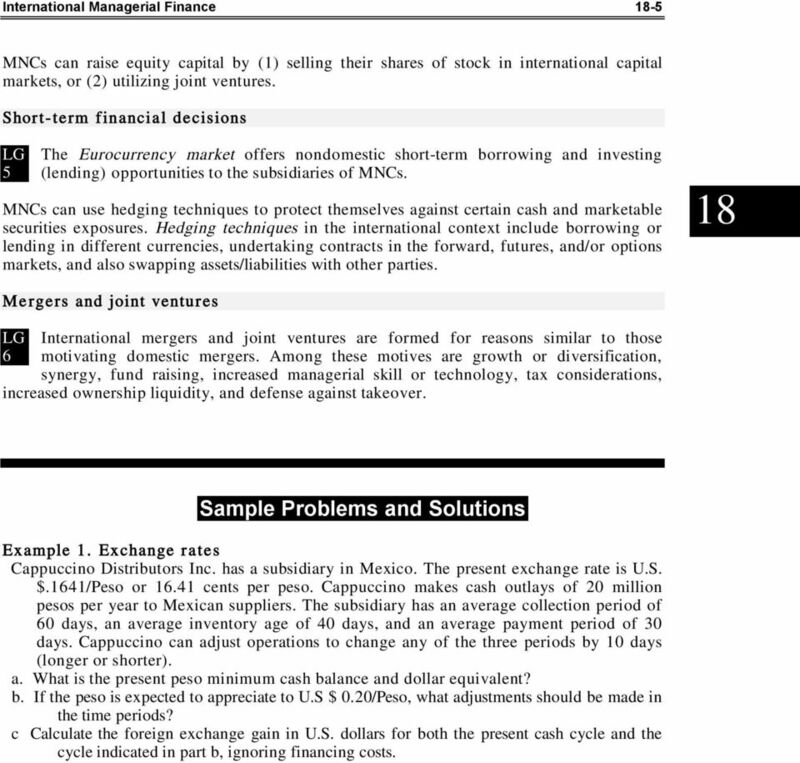 Chapter International Managerial Finance. 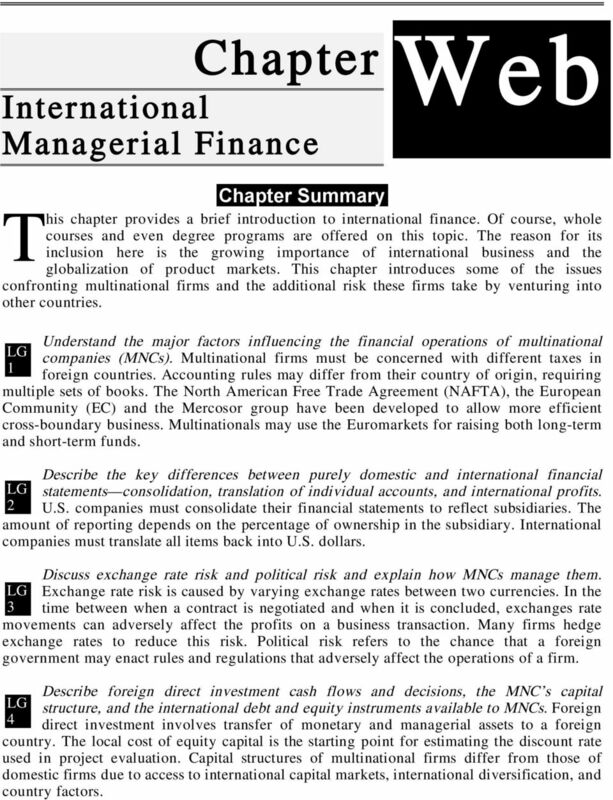 Chapter Summary"
1 Chapter International Managerial Finance Web T his chapter provides a brief introduction to international finance. Of course, whole courses and even degree programs are offered on this topic. The reason for its inclusion here is the growing importance of international business and the globalization of product markets. This chapter introduces some of the issues confronting multinational firms and the additional risk these firms take by venturing into other countries. 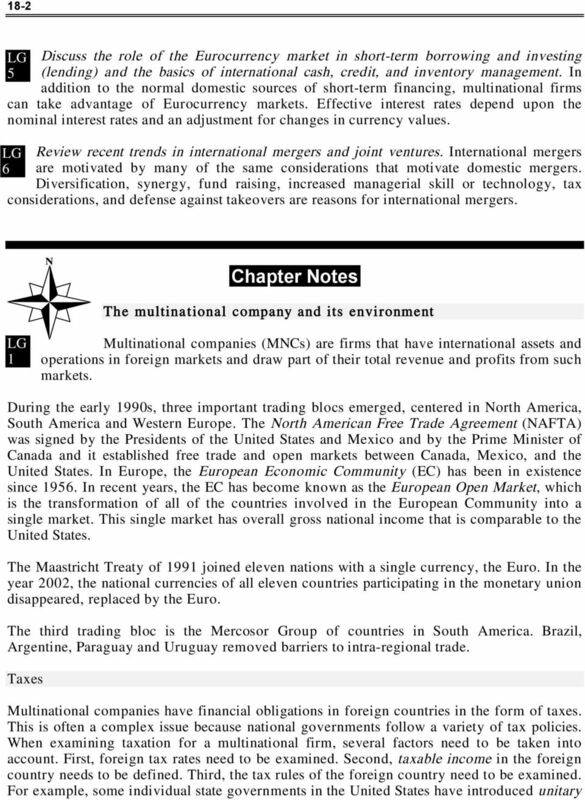 1 Chapter Summary Understand the major factors influencing the financial operations of multinational companies (MNCs). Multinational firms must be concerned with different taxes in foreign countries. 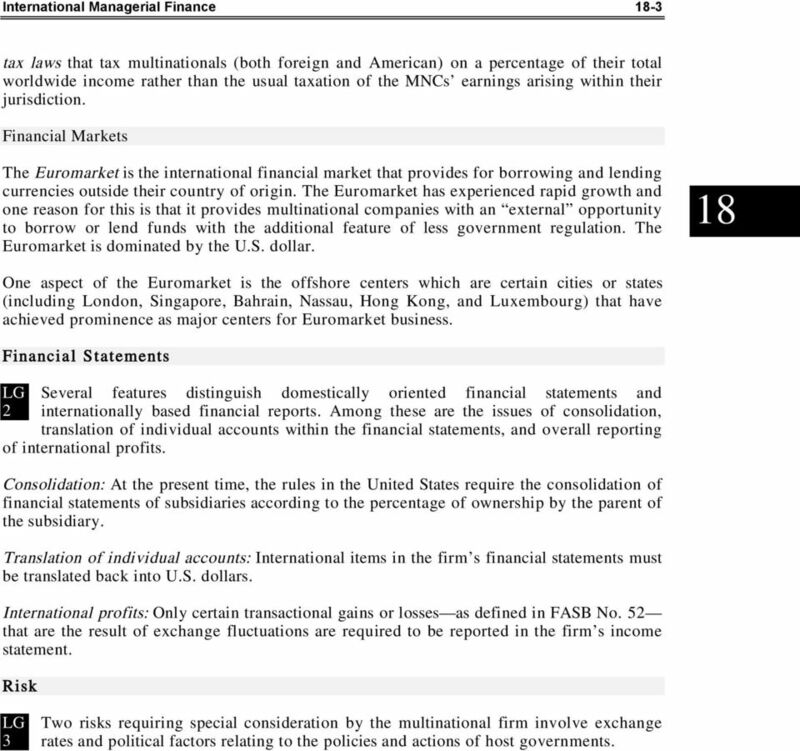 Accounting rules may differ from their country of origin, requiring multiple sets of books. The North American Free Trade Agreement (NAFTA), the European Community (EC) and the Mercosor group have been developed to allow more efficient cross-boundary business. Multinationals may use the Euromarkets for raising both long-term and short-term funds. Describe the key differences between purely domestic and international financial statements consolidation, translation of individual accounts, and international profits. 2 U.S. companies must consolidate their financial statements to reflect subsidiaries. The amount of reporting depends on the percentage of ownership in the subsidiary. International companies must translate all items back into U.S. dollars. Discuss exchange rate risk and political risk and explain how MNCs manage them. Exchange rate risk is caused by varying exchange rates between two currencies. In the 3 time between when a contract is negotiated and when it is concluded, exchanges rate movements can adversely affect the profits on a business transaction. Many firms hedge exchange rates to reduce this risk. Political risk refers to the chance that a foreign government may enact rules and regulations that adversely affect the operations of a firm. 4 Describe foreign direct investment cash flows and decisions, the MNC s capital structure, and the international debt and equity instruments available to MNCs. Foreign direct investment involves transfer of monetary and managerial assets to a foreign country. The local cost of equity capital is the starting point for estimating the discount rate used in project evaluation. Capital structures of multinational firms differ from those of domestic firms due to access to international capital markets, international diversification, and country factors. 3 International Managerial Finance 18-3 tax laws that tax multinationals (both foreign and American) on a percentage of their total worldwide income rather than the usual taxation of the MNCs earnings arising within their jurisdiction. Financial Markets The Euromarket is the international financial market that provides for borrowing and lending currencies outside their country of origin. The Euromarket has experienced rapid growth and one reason for this is that it provides multinational companies with an external opportunity to borrow or lend funds with the additional feature of less government regulation. The Euromarket is dominated by the U.S. dollar. 18 One aspect of the Euromarket is the offshore centers which are certain cities or states (including London, Singapore, Bahrain, Nassau, Hong Kong, and Luxembourg) that have achieved prominence as major centers for Euromarket business. Financial Statements 2 Several features distinguish domestically oriented financial statements and internationally based financial reports. Among these are the issues of consolidation, translation of individual accounts within the financial statements, and overall reporting of international profits. Consolidation: At the present time, the rules in the United States require the consolidation of financial statements of subsidiaries according to the percentage of ownership by the parent of the subsidiary. Translation of individual accounts: International items in the firm s financial statements must be translated back into U.S. dollars. 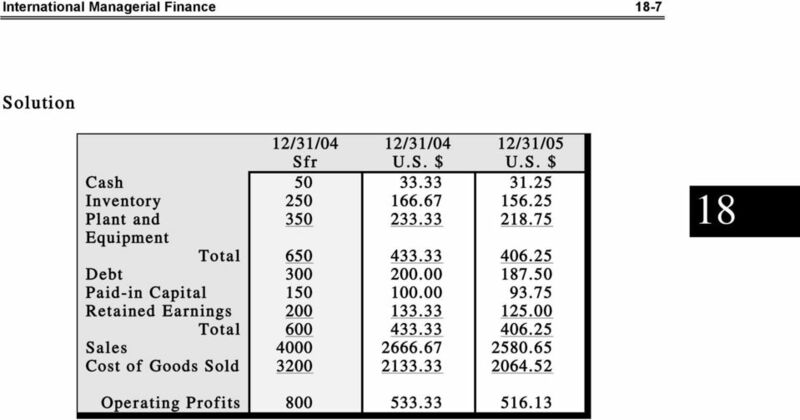 International profits: Only certain transactional gains or losses as defined in FASB No. 52 that are the result of exchange fluctuations are required to be reported in the firm s income statement. 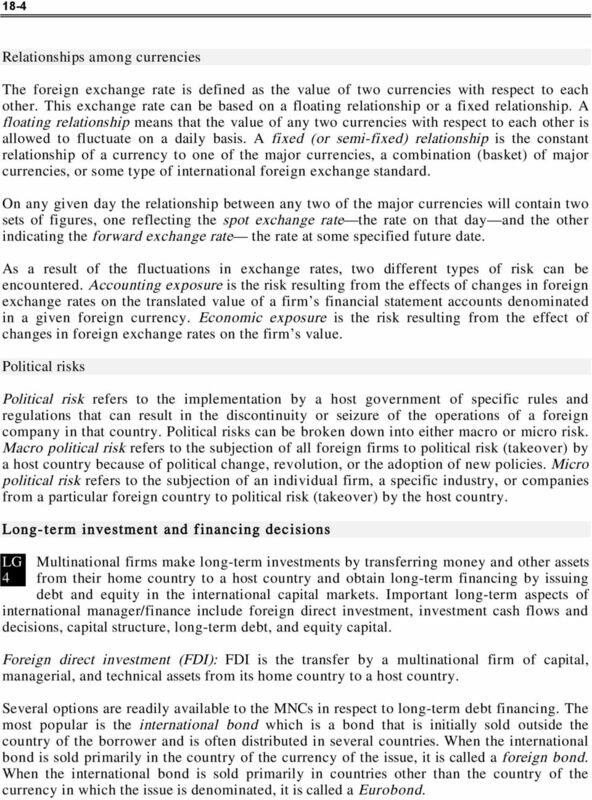 Risk 3 Two risks requiring special consideration by the multinational firm involve exchange rates and political factors relating to the policies and actions of host governments. 4 18-4 Relationships among currencies The foreign exchange rate is defined as the value of two currencies with respect to each other. This exchange rate can be based on a floating relationship or a fixed relationship. A floating relationship means that the value of any two currencies with respect to each other is allowed to fluctuate on a daily basis. A fixed (or semi-fixed) relationship is the constant relationship of a currency to one of the major currencies, a combination (basket) of major currencies, or some type of international foreign exchange standard. On any given day the relationship between any two of the major currencies will contain two sets of figures, one reflecting the spot exchange rate the rate on that day and the other indicating the forward exchange rate the rate at some specified future date. As a result of the fluctuations in exchange rates, two different types of risk can be encountered. Accounting exposure is the risk resulting from the effects of changes in foreign exchange rates on the translated value of a firm s financial statement accounts denominated in a given foreign currency. Economic exposure is the risk resulting from the effect of changes in foreign exchange rates on the firm s value. Political risks Political risk refers to the implementation by a host government of specific rules and regulations that can result in the discontinuity or seizure of the operations of a foreign company in that country. Political risks can be broken down into either macro or micro risk. Macro political risk refers to the subjection of all foreign firms to political risk (takeover) by a host country because of political change, revolution, or the adoption of new policies. Micro political risk refers to the subjection of an individual firm, a specific industry, or companies from a particular foreign country to political risk (takeover) by the host country. Long-term investment and financing decisions 4 Multinational firms make long-term investments by transferring money and other assets from their home country to a host country and obtain long-term financing by issuing debt and equity in the international capital markets. Important long-term aspects of international manager/finance include foreign direct investment, investment cash flows and decisions, capital structure, long-term debt, and equity capital. Foreign direct investment (FDI): FDI is the transfer by a multinational firm of capital, managerial, and technical assets from its home country to a host country. Several options are readily available to the MNCs in respect to long-term debt financing. The most popular is the international bond which is a bond that is initially sold outside the country of the borrower and is often distributed in several countries. When the international bond is sold primarily in the country of the currency of the issue, it is called a foreign bond. When the international bond is sold primarily in countries other than the country of the currency in which the issue is denominated, it is called a Eurobond. 5 International Managerial Finance 18-5 MNCs can raise equity capital by (1) selling their shares of stock in international capital markets, or (2) utilizing joint ventures. Short-term financial decisions 5 The Eurocurrency market offers nondomestic short-term borrowing and investing (lending) opportunities to the subsidiaries of MNCs. MNCs can use hedging techniques to protect themselves against certain cash and marketable securities exposures. Hedging techniques in the international context include borrowing or lending in different currencies, undertaking contracts in the forward, futures, and/or options markets, and also swapping assets/liabilities with other parties. 18 Me rgers and joint ventures International mergers and joint ventures are formed for reasons similar to those 6 motivating domestic mergers. Among these motives are growth or diversification, synergy, fund raising, increased managerial skill or technology, tax considerations, increased ownership liquidity, and defense against takeover. Sample Problems and Solutions Example 1. Exchange rates Cappuccino Distributors Inc. has a subsidiary in Mexico. The present exchange rate is U.S. $.1641/Peso or cents per peso. Cappuccino makes cash outlays of 20 million pesos per year to Mexican suppliers. The subsidiary has an average collection period of 60 days, an average inventory age of 40 days, and an average payment period of 30 days. Cappuccino can adjust operations to change any of the three periods by 10 days (longer or shorter). a. What is the present peso minimum cash balance and dollar equivalent? b. If the peso is expected to appreciate to U.S $ 0.20/Peso, what adjustments should be made in the time periods? c Calculate the foreign exchange gain in U.S. dollars for both the present cash cycle and the cycle indicated in part b, ignoring financing costs. 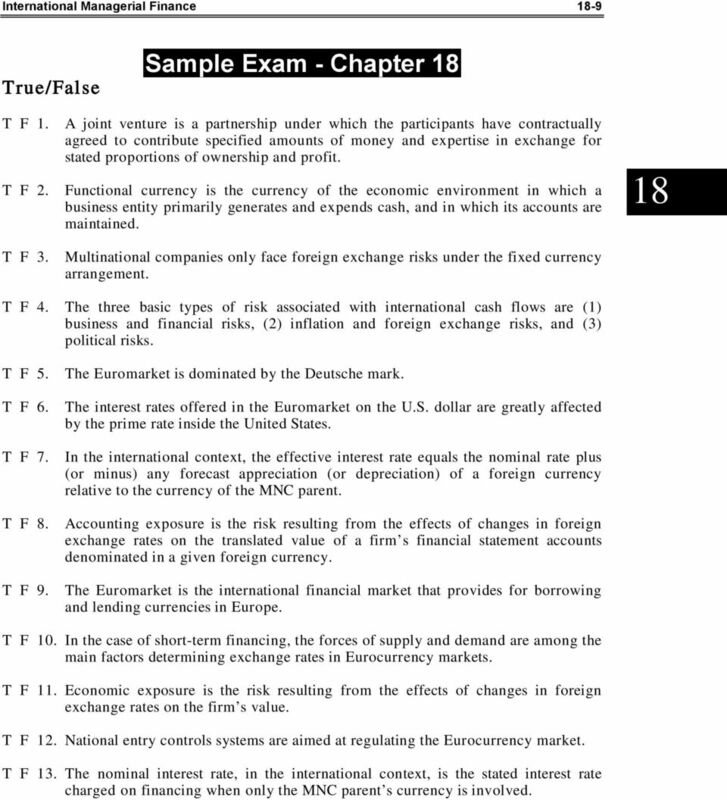 9 International Managerial Finance 18-9 True/False Sample Exam - Chapter 18 T F 1. A joint venture is a partnership under which the participants have contractually agreed to contribute specified amounts of money and expertise in exchange for stated proportions of ownership and profit. T F 2. Functional currency is the currency of the economic environment in which a business entity primarily generates and expends cash, and in which its accounts are maintained. 18 T F 3. Multinational companies only face foreign exchange risks under the fixed currency arrangement. T F 4. The three basic types of risk associated with international cash flows are (1) business and financial risks, (2) inflation and foreign exchange risks, and (3) political risks. T F 5. The Euromarket is dominated by the Deutsche mark. T F 6. The interest rates offered in the Euromarket on the U.S. dollar are greatly affected by the prime rate inside the United States. T F 7. In the international context, the effective interest rate equals the nominal rate plus (or minus) any forecast appreciation (or depreciation) of a foreign currency relative to the currency of the MNC parent. T F 8. Accounting exposure is the risk resulting from the effects of changes in foreign exchange rates on the translated value of a firm s financial statement accounts denominated in a given foreign currency. T F 9. The Euromarket is the international financial market that provides for borrowing and lending currencies in Europe. T F 10. In the case of short-term financing, the forces of supply and demand are among the main factors determining exchange rates in Eurocurrency markets. T F 11. Economic exposure is the risk resulting from the effects of changes in foreign exchange rates on the firm s value. T F 12. National entry controls systems are aimed at regulating the Eurocurrency market. T F 13. The nominal interest rate, in the international context, is the stated interest rate charged on financing when only the MNC parent s currency is involved. 10 18-10 T F 14. Adjustments in the MNC s operations can be used to hedge against exchange rate fluctuations. T F 15. The motives for domestic mergers differ greatly from the motives for international mergers. Multiple Choice 1. Several U.S. states have imposed, which tax MNCs on a percentage of their total world wide income. a. international income duties c. joint ventures b. unitary tax laws d. gross international duties (GIDs) 2. All of the following are considered offshore centers EXCEPT a. Costa Rica. c. Hong Kong. b. Singapore. d. London. 3. The Euromarket is dominated by the a. Mexican peso. c. French franc. b. Japanese yen. d. U.S. dollar. 4. When fewer units of a foreign currency are required to buy one dollar, the currency is said to have with respect to the dollar. a. consolidated c. depreciated b. appreciated d. remained fixed 5. The risk resulting from the effects of changes in foreign exchange rates on the translated value of a firm s accounts denominated in a given foreign currency is a. micro political risk. c. accounting exposure. b. economic exposure. d. macro political risk. 6. All of the following are considered to be major or hard currencies EXCEPT a. the Mexican peso. c. the U.S. dollar. b. the Japanese yen. d. the British pound. 7. Between two major currencies, the spot exchange rate is the rate and the forward exchange rate is the rate a. today; on that date. c. at some specified future date; today. b. on that date; today. d. on that date; at some specified future date. 12 The usual exchange rate quotation in international markets is given as where the unit of account is the Deutsche Mark and the unit of currency being priced is one U.S. dollar. a. DM 1.00 = C$1.34 c. DM 1.83/US$ b. US$1.83/DM d. US$ 3:1 DM 18. A is an international bond that is sold primarily in countries other than the country of the currency in which the issue is denominated. a. foreign bond c. hedge bond b. Eurobond d. capitalization bond 19. NAFTA was signed by the leaders of all of the following countries EXCEPT a. United States. c. Canada. b. Mexico. d. Chile. 20. 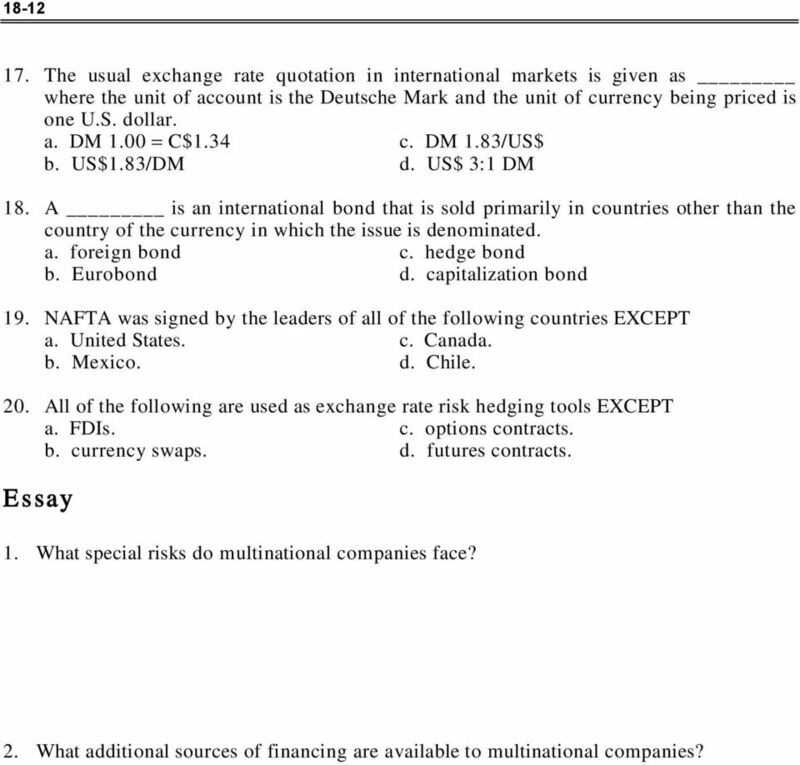 All of the following are used as exchange rate risk hedging tools EXCEPT a. FDIs. c. options contracts. b. currency swaps. d. futures contracts. Essay 1. What special risks do multinational companies face? 2. What additional sources of financing are available to multinational companies? 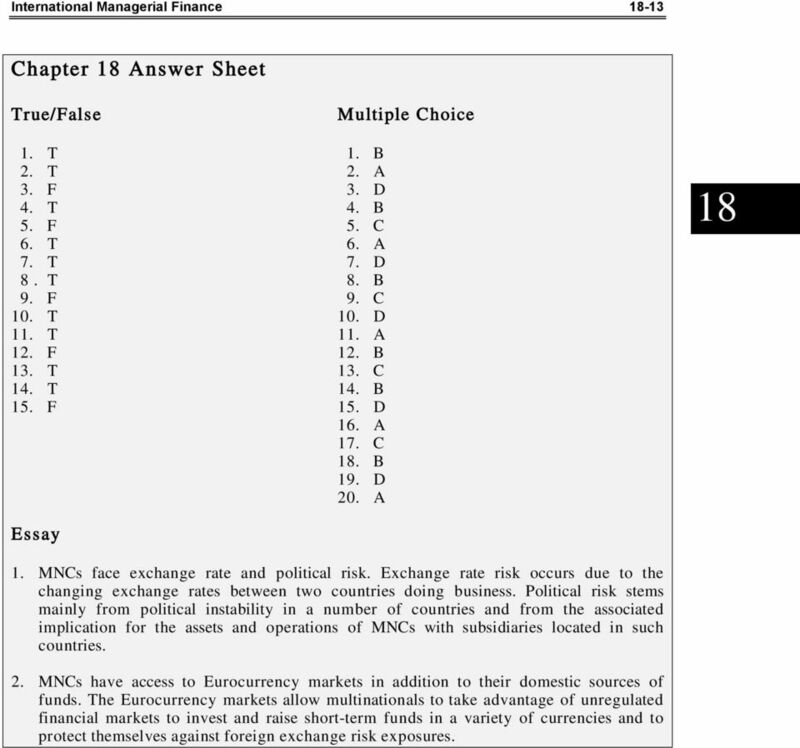 13 International Managerial Finance Chapter 18 Answer Sheet True/False Multiple Choice 1. T 1. B 2. T 2. A 3. F 3. D 4. T 4. B 5. F 5. C 6. T 6. A 7. T 7. D 8. T 8. B 9. F 9. C 10. T 10. D 11. T 11. A 12. F 12. B 13. T 13. C 14. T 14. B 15. F 15. D 16. A 17. C 18. B 19. D 20. A 18 Essay 1. MNCs face exchange rate and political risk. Exchange rate risk occurs due to the changing exchange rates between two countries doing business. Political risk stems mainly from political instability in a number of countries and from the associated implication for the assets and operations of MNCs with subsidiaries located in such countries. 2. MNCs have access to Eurocurrency markets in addition to their domestic sources of funds. The Eurocurrency markets allow multinationals to take advantage of unregulated financial markets to invest and raise short-term funds in a variety of currencies and to protect themselves against foreign exchange risk exposures. 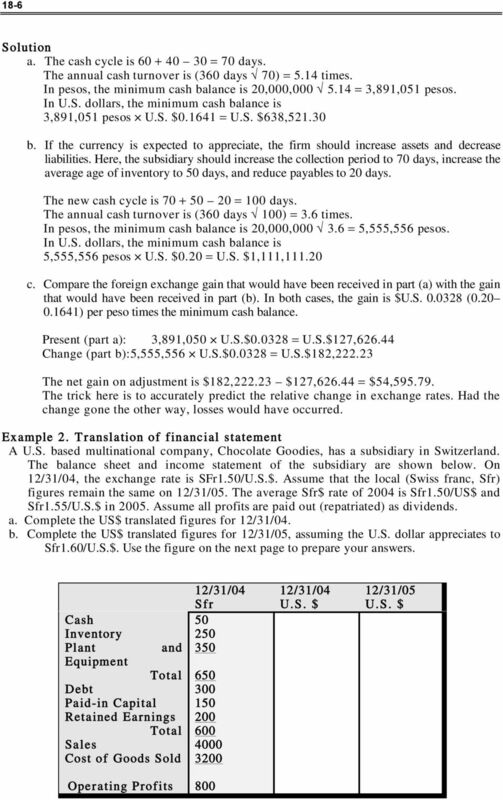 Advanced Accounting 1005-83B Issues Involving Foreign Currency Page 1 I. SFAS No. 52. "Foreign Currency Translation" ISSUES INVOLVING FOREIGN CURRENCY A. Background: In SFAS No. 8 "Foreign Currency Translation"